How does a woman become a whore? What are the discursive dynamics making a woman a whore? And, more importantly, what are the discursive mechanics of unmaking? 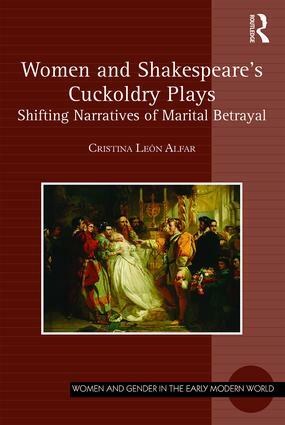 In Women and Shakespeare’s Cuckoldry Plays: Shifting Narratives of Marital Betrayal, Cristina León Alfar pursues these questions to tease out familiar cultural stories about female sexuality that recur in the form of a slander narrative throughout William Shakespeare’s work. She argues that the plays stage a structure of accusation and defense that unravels the authority of husbands to make and unmake wives. While men’s accusations are built on a foundation of political, religious, legal, and domestic discourses about men’s superiority to, and rule over, women, whose weaker natures render them perpetually suspect, women’s bonds with other women animate defenses of virtue and obedience, fidelity and love, work loose the fabric of patrilineal power that undergirds masculine privileges in marriage, and signify a discursive shift that constitutes the site of agency within a system of oppression that ought to prohibit such agency. That women’s agency in the early modern period must be tied to the formations of power that officially demand their subjection need not undermine their acts. In what Alfar calls Shakespeare’s cuckoldry plays, women’s rhetoric of defense is both subject to the discourse of sexual honor and finds a ground on which to “shift it” as women take control of and replace sexual slander with their own narratives of marital betrayal. Cristina León Alfar is Associate Professor of English at Hunter College, CUNY, USA.